The certification from the beneficiary, about the inauguration or serial production in the previous year, the technical and economical results obtained. To the original published works (textbooks, wherever the level is, are not accepted) must be enclosed three recommendations of institutions or engineering personalities that are using the work, specifying the scientific value and the novelty character. The proposals may be sending until June 1. During the award festivity, every work that has been awarded a prize will be presented on a videotape VHS, no longer that five minutes. 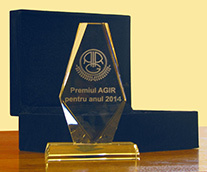 The AGIR Award is awarded on the occasion of the Romanian Engineer Day, which is celebrating on September 14.